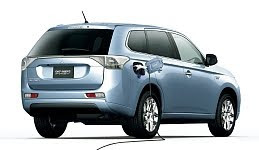 Mitsubishi Motors Corporation (MMC) announced today that the new Outlander PHEV will go on sale at dealerships throughout Japan from January 24, 2013. 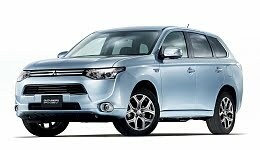 Powered by the Plug-in Hybrid EV System powertrain derived from MMC's lineup of electric vehicles (EVs), the Outlander PHEV will have a manufacturer's suggested retail price (MSRP) of ¥3,324,000 - ¥4,297,000 (including consumption tax). The Outlander PHEV qualifies for Japan's "eco-car" tax incentives*1 and the Ministry of Economy, Trade and Industry's "Subsidies for measures designed to promote introduction of clean energy vehicles" (maximum ¥430,000), making the actual cost to the customer as low as ¥2,894,000. The world's first plug-in hybrid SUV, the Outlander PHEV represents a fusion of the EV technologies developed by MMC for models such as the i-MiEV, 4WD technologies honed in the Lancer Evolution, and SUV know-how gained from the Pajero (Montero or Shogun in some countries). The result is a groundbreaking new model that brings together the superior environmental performance and quietness of an EV, the stability and handling of a 4WD, and the practicality of an SUV. The Outlander PHEV will be available in five trim levels: the base G, the G Safety Package fitted with MMC's "e-Assist" (Japan-market name) advanced safety technology system, the G Navi Package, which comes with on-board navigation and other features, the G Premium Package, which features a RockfordFosgate® Premium Sound System and leather-upholstered seats for extra comfort, and the built-to-order E.
MMC has made state-of-the-art safety technology more accessible for anyone who wants the Outlander PHEV. The acclaimed e-Assist advanced safety technology package - now installed in over 80% of new Outlander models in Japan - is available as standard equipment from the trim level of G Safety Package and higher, for a difference of as low as just ¥95,000 over the base G.
In Series Hybrid Mode the gasoline engine operates as a generator supplying electricity to the electric motors. The system switches to this mode when the remaining charge in the battery falls below a predetermined level and when more powerful performance is required, such as accelerating to pass a vehicle or climbing a steep gradient such as a slope. The system switches to Parallel Hybrid Mode when the vehicle reaches high speeds. In this mode the high-efficiency gasoline engine provides most of the motive power, assisted by the electric motors as required, such as when more powerful performance is required to accelerate or climb a slope. Mitsubishi developed the Plug-in Hybrid EV System based on the EV technologies used in the i-MiEV and MINICAB-MiEV for use in mid-size and larger passenger cars that require longer cruising ranges. 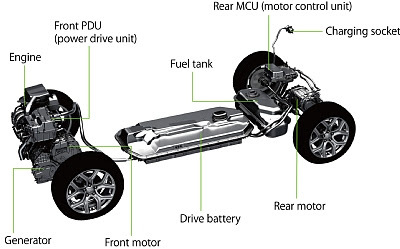 The drive battery is a high-capacity lithium-ion battery developed for the PHEV System based on the technology used in the i-MiEV and MINICAB-MiEV (16.0 kWh models). It consists of 80 cells mounted in series housed in a battery pack enclosed in a secure frame, and has a total voltage of 300V and total storage capacity of 12.0 kWh. The battery can be switched to Battery Charge Mode, which allows electricity to be generated by the engine and stored when stationary or on the move (giving 80% charge in approximately 40 minutes when stationary) and Battery Save Mode, which maintains charge while driving. Stored electricity can be used in EV Drive Mode at the destination or used to power appliances. Estimated charging times at 200 V AC (15 A) is approximately 4 hours for a full charge; quick-charging (factory option) to an 80% charge takes approximately 30 minutes. The battery also supports a 100V AC power supply capable of delivering up to 1,500W of electricity (factory option) as an external power source. Smaller, lighter, higher output versions of the permanent magnet synchronous motors used in the i-MiEV and MINICAB-MiEV are located front and rear. These have a maximum output of 60 kW each and maximum torques of 137 N·m(101 lb-ft) (front) and 195 N·m (144 lb-ft) (rear). The 4B11 2.0-liter inline-four gasoline engine functions solely to generate electricity in Series Hybrid Mode and is mainly used to provide motive power in Parallel Hybrid Mode. It is fitted with MMC’s MIVEC (Mitsubishi Innovative Valve timing Electronic Control system) technology, which keeps the engine in optimal efficiency ranges by continuously varying the timing of the air intake valves according to engine speed in Parallel Hybrid Mode. Additionally, exhaust noise has been reduced and the engine room soundproofing increased in order to ensure the vehicle remains as quiet as EV Drive Mode, even when the engine is in use. The engine delivers 87 kW (117 hp) at 4,500 rpm and maximum torque (net) of 186 N·m (137 lb-ft). In Series/Parallel Hybrid Mode and in Battery Charge/Save Mode, the generator generates electricity through motive power from the engine to store into the drive battery. Taking advantage of the fact that electric motors require no complex transmission mechanisms, the front and rear transaxles incorporate simple single-speed fixed reduction gears for smoother travel free from “shift shock.” The front transaxle also has a built-in clutch that switches the system to Parallel Drive Mode mainly for engine-powered travel at high speeds. MMC developed a new Twin Motor 4WD system that delivers power independently to the front wheels (from the front motor and/or engine) and rear wheels (from the rear motor). The use of motors and absence of mechanical connections such as a propeller shaft mean the Twin Motor 4WD delivers better response and finer control than conventional 4WD systems and reduces friction loss. Twin Motor 4WD is coupled with MMC’s S-AWC (Super All Wheel Control) integrated vehicle dynamics control system, which combines front- and rear-wheel drive control and left and right wheel brake control to provide consistent handling and stability on the road. Two modes are offered, selectable at the flick of a switch: Normal Mode for ordinary conditions and Lock Mode for enhanced all-terrain performance. During deceleration, the motors function as generators so that electricity can be generated to charge the drive battery. The regenerative braking can be increased when the brake pedal is pressed. The strength of regenerative braking is adjustable using the selector lever, which has three strength settings, and a paddle selector on the steering wheel (standard on all trim levels except E), which offers six strength settings. The regeneration level can be selected as the driver likes according to road conditions, such as when approaching a bend or descending a mountain road, or when seeking a sportier ride. Body and chassis. The Outlander PHEV features enhancements including a reinforced body to ensure high levels of impact safety and stability. MMC has also made meticulous efforts to dampen vibration and insulate and absorb sound, resulting in the kind of interior comfort unique to a PHEV. The front and rear suspensions have been tuned to handle the weight of the Plug-in Hybrid EV System and reduce road noise. Placing the drive battery under floor lowers the center of gravity, which provides improved stability and ride comfort. e-Assist safety system. The advanced e-Assist safety system available on some trim levels comprises three functions: the Forward Collision Mitigation System (FCM), which automatically helps avoid a collision with the vehicle ahead or reduce impact damage in the event of a collision; the Lane Departure Warning System (LDW), which alerts the driver when the vehicle starts to drift from its lane aiding driver concentration; and the Adaptive Cruise Control System (ACC), which automatically maintains a driver-adjustable distance with the vehicle in front, reducing the chance of a collision if the vehicle suddenly stops. Active Stability Control (ASC) is standard on all models. This controls delivery of drive and braking force to the four wheels to prevent skidding on slippery roads or when sudden steering changes are made. 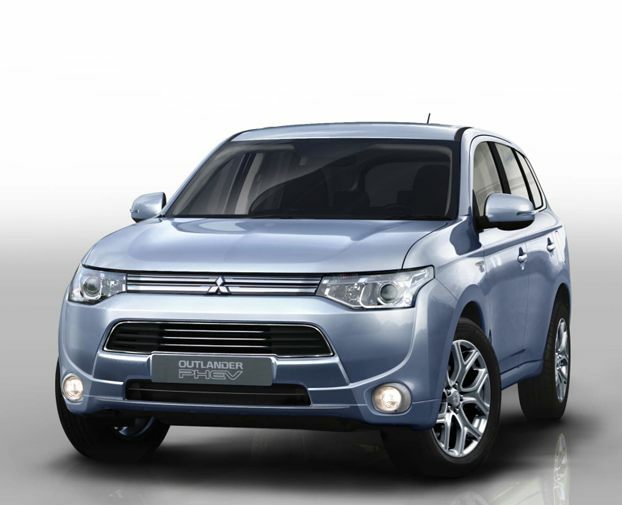 As on ICE models, all Outlander PHEV models come standard with a total of seven SRS airbags: driver and passenger seat airbags, side and curtain airbags, and a knee airbag for the driver. With a Reinforced Impact Safety Evolution (RISE) safety body, the Outlander PHEV is fully fitted to protect occupants in the event of a collision. Remote control. The Outlander PHEV can be remote-controlled through specially-designed smartphone or tablet applications, making available variety of functions, including scheduled charging, pre-air conditioning, and access to information on battery charge and door status (factory option on most trim levels).